You know you've mastered the art of Thanksgiving when even your yoga pants are significantly tighter than before. Tragically, we must now put our beloved cranberry sauces to rest and prepare for a new season: the winter wonderland. We're talking chestnut praline lattes, a dangerously addictive Bath & Body Works holiday collection, and Home Alone marathons (or Harry Potter⎯take your pick). And don't forget, now is also the time to craft your holiday wishlists and make those (material) dreams into a reality. As for me? 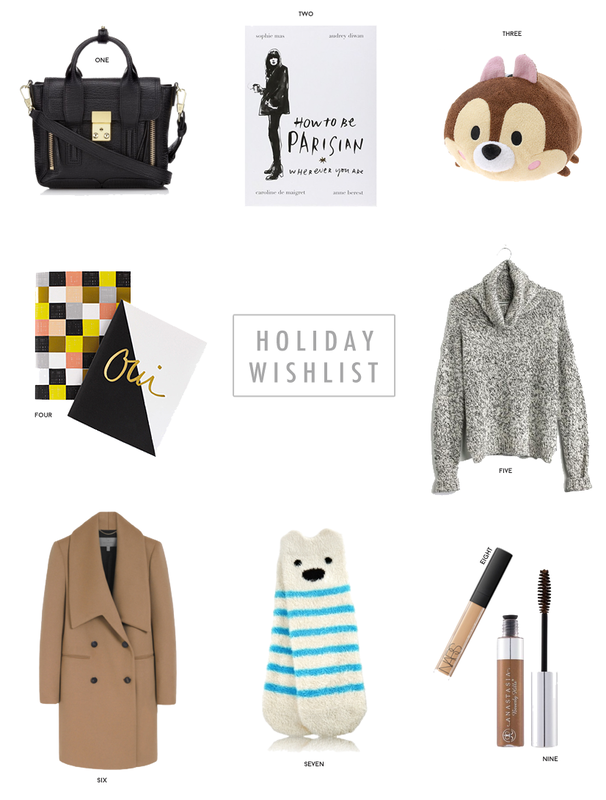 My Christmas lusts are certainly a mix; from adorable trinkets I am most likely too "old" for to the more college appropiate goods, here are the treats I'm hoping to ask from Santa this year! [one] 3.1 PHILLIP LIM PASHLI MINI SATCHEL - Running in at the top tier of my wishlist is this luxe (but pricey) favorite. It's only natural that my dream handbag would make the cut, considering I've been coveting this masterpiece for ages now. The zipper detailing is what especially drew me in, and the compact size renders it the perfect companion for my petite frame. While on the L train the other week, I spotted a girl toting the same bag⎯I don't know about you, but I think this is a sign from fate. [two] HOW TO BE PARISIAN: WHEREVER YOU ARE - Since I'll be jet-setting to the City of Lights very soon (and living there for four months), I thought this book would make a library essential. Not only is this read Instagram-worthy, but it doubles as your 101 on Parisian fashion, culture, and lifestyle. Education comes first after all, but I'll pass on the stereotypical cigarettes. [three] DISNEY CHIP TSUM TSUM PLUSH - Confession: I raced to the Disney Store on Black Friday just to reunite with the clique of supreme cuteness... Tsum Tsums! Once upon a time, Tsum Tsums were an exotic species, only to be found in Disney stores in Japan. Miraculously, these swoon-worthy plushies carved a home in US soil as well, and mankind has not remained the same since. Because I am actually seven-years-old, I knew I had to add this Chip Tsum Tsum to my menagerie of Disney plushies (disclaimer: I am fully aware that I have no absolute need for a Tsum Tsum). [four] GARANCE DORÉ OUI/NON NOTEBOOK SET - Your notetaking game just got elevated to the next level. Meet fashion blogger, illustrator, and now creator of the prettiest paper goods, Garance Doré, the jack of all trades. It requires much self-control to keep your shopping cart at bay while browsing through her store, which is packed full of treasures ranging from haute greeting cards and stylish desk calenders. My choice pick? This French chic notebook set that will transform mundane class lectures into a lesson on taste. [five] MADEWELL TURTLENECK SWEATER - With this year's inevitable Polar Vortex to descend upon the East Coast, investing in a classic turtleneck is suddenly a no brainer. My game plan is to maximize turtlenecks through the power of layering⎯pairing it under a fur-trimmed coat makes an effortless yet cozy get-up. Plus, no scarf necessary! [six] MULBERRY GRACIE WOOL CASHMERE COAT (similar) - My search for the quintessential double-breasted coat is officially over.... thank-you, Mulberry. I can already imagine sporting this dreamy coat from the streets of Manhattan to the avenues of Paris. Its rich cognac hue is a refreshing spin on classic black and will compliment the many patterns of my wardrobe (read: leopard print and stripes). [seven] BATH & BODY WORKS POLAR BEAR SHEA-INFUSED SOCKS - B&BW devotees rejoice! I first discovered these adorable polar bear socks while doing my annual hand sanitizer run on Black Friday (and spoiler alert: I surprisingly kept my shopping tame). Socks are a Christmas gift tradition, and there's no better way to truly pamper yourself than with shea-infused polar bear socks... emphasis on the shea-infused. [eight] NARS RADIANT CREAMY CONCEALER - College equates to dreaded under-eye circles, and the only cure hails from the cosmetic kingdom of NARS. For an instant eye-lift, this is your ultimate concealer. Its velvety formula is perfect for masking those five hours of sleep we like to pretend didn't happen. The only reason it nailed a spot on my must-haves? My mom currently has taken my trusty concealer hostage, leaving me vulnerable and prone to attack. [nine] ANASTASIA BEVERLY HILLS TINTED BROW GEL - Yes, I have eyebrow gel on my wishlist this year. This is the key to ensuring long-lasting brows whether you're team powder or pro pencil. And take my word for it: brow gel does make a subsantial difference. What's on your holiday wishlist this year?